It’s Memorial Day weekend, and many of us will be attending BBQs, potlucks, and other early-summer food parties. If you’re looking for a grill or BBQ alternative, sloppy janes are an easy, and delicious option. 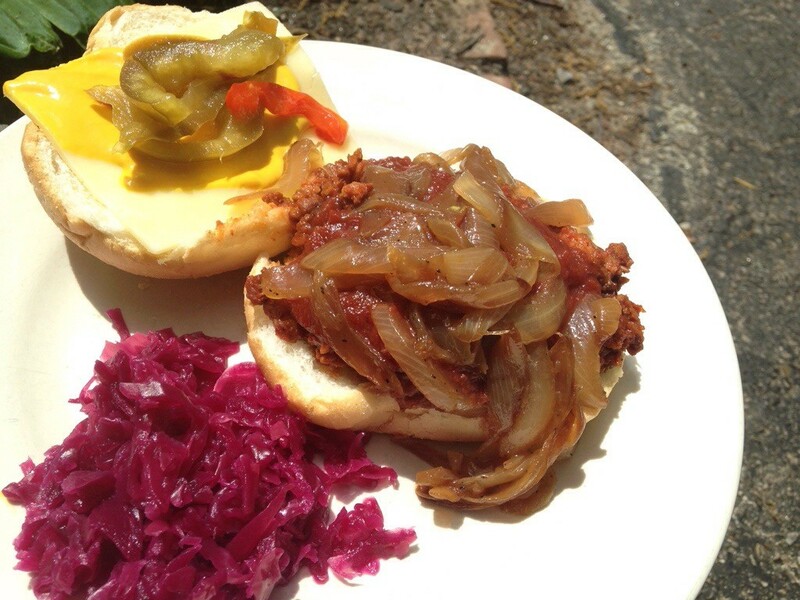 I cook part-time at a Quaker retreat center that focuses on local, organic and plant-free menus, and we recently made these “sloppy joe” – type sandwiches with crumbled and fried tempeh instead of meat. If you’re new to tempeh, remember to boil it before cooking, otherwise it can have a bitter aftertaste. Then crumble, and fry like you would hamburger for sloppy joes. I fried the above tempeh with onions and garlic, and then added my own special sauce, a spicy vinegar-based BBQ cut with tomato sauce, some spices, extra cider vinegar, and a touch of mollasses. The fried tempeh can then be stirred right into the sauce, until you achieve your desired “sloppy” consistancy. Easy! Like traditional sloppy joes, this is also an easy dish to throw in the crock pot and take along to a BBQ or potluck. I served sloppy janes on a crusty sourdough roll, with carmelized onions, cheddar, and plenty of mustard and hot peppers, but these sandwiches go great with any kind of traditional BBQ sandwich topping, including pickles, hot sauce, sourkraut or coleslaw – the list goes on! Add some mac & cheese and some greens and youve got a great Southern-Style BBQ meal. Enjoy your holiday weekend!